For 3 years I have run a blog where I publish only infographics and make money only with infographics. My co-founder Mark and I made them all ourselves. Our most popular infographics get 500,000 views per year each. We used to make them by hand, but now we use Adioma, our infographic maker, to create them at least 30 times faster (more on that later). But it wasn’t until we figured out a methodology for making money on infographics that we got all this traffic. In a nutshell, it looks like this. 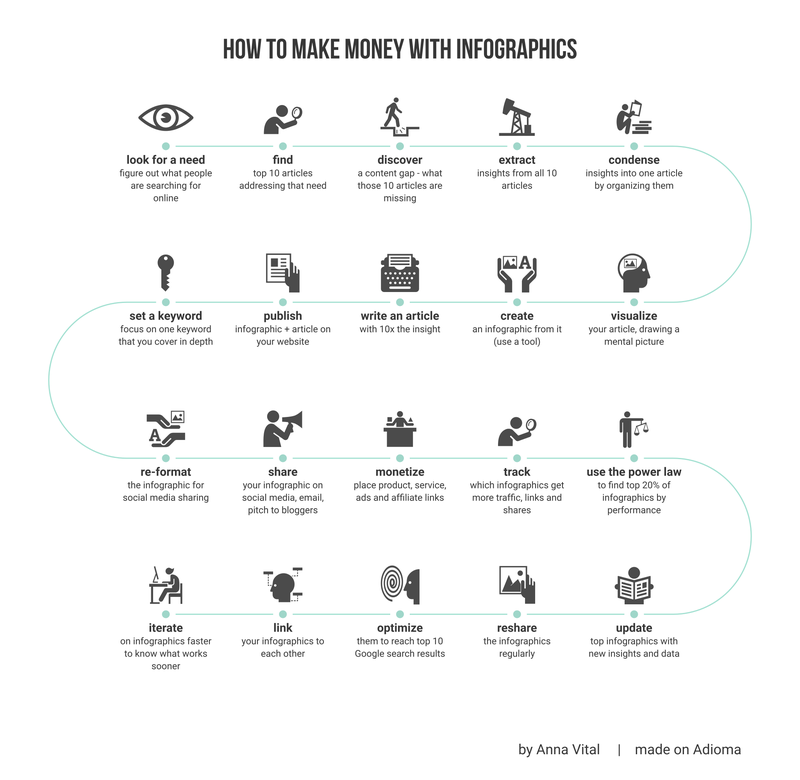 Now I will tell you exactly how we make money with infographics. Why? Because I am a visual learner, so I want the world to be more visual. If you create even one infographic after reading this article, I will consider my life a life well-lived. The first step is the most important – find a need. You came here to read my article because you have a need. Now think how many other people have their own needs. You can be the one who will fill their needs through infographics, at scale. The more needs you fill and the better you do it, the more money you make. Information is the new oil. To make money, mine the world for valuable information, extract the insights, then refine them into consumable infographics. The better your refining process, the more money you make “per barrel”. Find a need. Figure out what people are searching for online. For this, you can use Google Trends to see comparative search volume over time (for example, you can see whether “infographics” are more popular than “data visualization”). But that information does not reveal the traffic potential. For that you need to know the absolute search volume (Google Trends doesn’t show that, however, you could use Google Adwords to estimate it by creating an ad campaign). 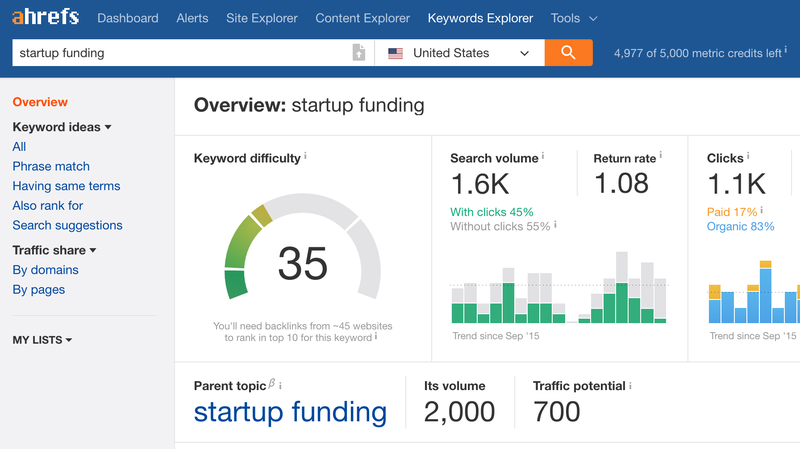 I use Ahrefs Keyword Explorer, a service that shows you exactly how many people search for a certain term and which words they are using to do that. Here I am looking at how many people search for “startup funding” in the U.S. alone. With this data, I can estimate how much traffic I can get and I know how many links I need to rank at the top (the number is 45, you can see that below the keyword difficulty). So did this work for me? If you google “startup funding” you will see my infographic at the top, in the first position. Find top 10 articles about it and mine them for insights. Condense those insights into a single article with 10x the insight. Treat these insights like money. This is not as hard as it sounds. 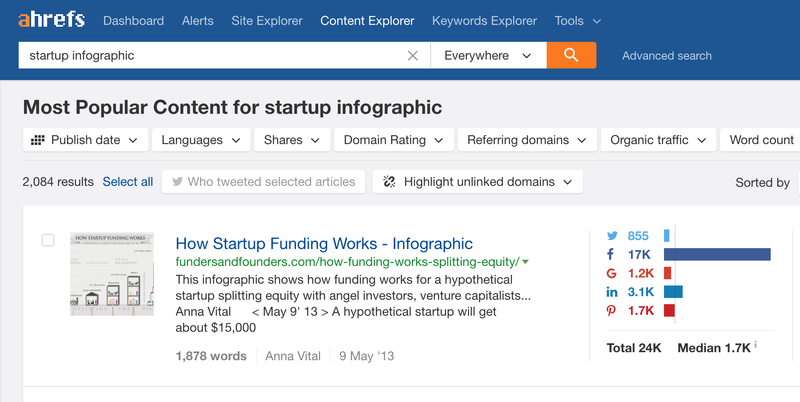 To find top articles you can use either google or Ahrefs Content Explorer. 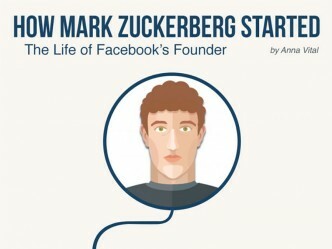 Let’s say I want to know what the best startup-related infographics are. And then I want to make something even better. I sorted these by Facebook shares because that is where I share my infographics. Discover a content void – the easiest way to think of a content void is this: on one hand there are people who have a question that they are searching for, on the other hand there are not enough people who write answers to this question. So there is a void between information demand and information supply. These voids exist for many reasons. 1. Elephant in the room questions (obvious questions that everyone assumes are obvious but they are not). I wrote more on this below to give you examples. 2. Question about how exactly to do something – here readers are looking for more details than writers tend to provide. 3. Connecting the dots questions – these questions seek to find a connection between things that people have traditionally views as not being connected. There are others examples of content void, of course. Extract insights and organize them. How do you extract insight? Find the most actionable (advice) and/or well-researched (facts) pieces in each article. Visualize the article (for visual thinkers only) – draw a mental picture of how these insights connect in space. This will help you to create a better infographic and a more structured article. Create an infographic. What is an infographic anyway? Any structured graphic representation of information qualifies. You could even hand-draw it and take a picture. I use Adioma now to make infographics fast. I don’t have the time to design infographics for weeks like I used to. Our brain know what is information and what is not. That’s why you do not need to put stock photos, or illustrations just to create an “eye-catching” image. These things are so available that readers have learned to ignore them, according to these eye-tracking studies. Write an article with 10 x the insight, mimicking the structure of the infographic you created and expanding on each point. Writing shows the details, infographic shows the big picture and the way things connect. Choose a focus keyword. This keyword is the one you want Google’s crawler to find when indexing your page. To show Google that this article is really about this keyword, it needs to be in the URL, in the article title, and in the subheadings. There is an art to putting the keywords into the article without overdoing it. I use Yoast plugin for WordPress to keep track keyword optimization. the thumbnail offers value enough to make people want to read further. Share your infographic on social media, email, and send it to other bloggers and writers on your topic. Pro tip: use saturated colors for the social media versions and less saturated on your actual blog. Monetize -offer products, services, place ads, and/or affiliate links alongside the infographics. More on which monetization strategies work best below. Track which infographics get more traffic, more links, and more social shares. These are important for different reasons: 1. Traffic gets you more eyeballs to sell your product, shows ads, and affiliate links. 2. Links raise the rank of your website (domain rant is the most important here) in Google so that you can get more traffic; 3. Social shares will give you credibility and instant access to the top of social feeds. In other words, traffic=eyeballs now, links and shares=eyeballs later. I use Google Analytics to track traffic, and Ahrefs Site Explorer to track links and social shares. Use the power law to find your top-performing infographics by traffic, links, and social shares. The power law says that 20% of your infographics will bring you 80% of the total traffic. Find the top 20% percent in each category, and update them regularly. Update your top infographics. Now you want to optimize these 20% – do further research, add infographics to the article based on reader suggestions, add sources (both that support and contradict your article.) All updates help your article rank higher and give you a reason to re-engages your readers and re-share on social media. Re-share the infographics regularly on social media. Change the insight that you highlight in the post every time. Other ways to re-share are cropping different parts of your infographics, and present it as a carousel or a video that pans the infographic, for example. Optimize to reach top 10 Google search results. 80% of all Google search traffic goes to the top 10 search results, according to this cumulative study. How long will it take you to reach the top 10? The average top 10 page gets there within 2 years, according to this Ahrefs research study. Can you do it faster? Yes, 22% of pages make it within one year. Do this by identifying a “content void” – a topic that a lot of people search for and not a lot of writers write about. More on this later. Link your infographics to each other – once you have 10 infographics, link their articles to each other. A good infographic answers a question while raising other questions. Answer these new questions in the next infographic. You want to create an experience for your user to follow a long train of thought without leaving your site. Use tags to organize similar infographics. This also helps them rank higher in Google. Iterate on infographics faster to know what works sooner. The more infographics you make, the sooner you know what your reader is interested in. Publish drafts of infographics to gauge the reaction. They do not have to be perfect design-wise, they just need to fill a need. How can you be faster? Use a tool like Adioma to automate your design. The short answer is as much as you want. 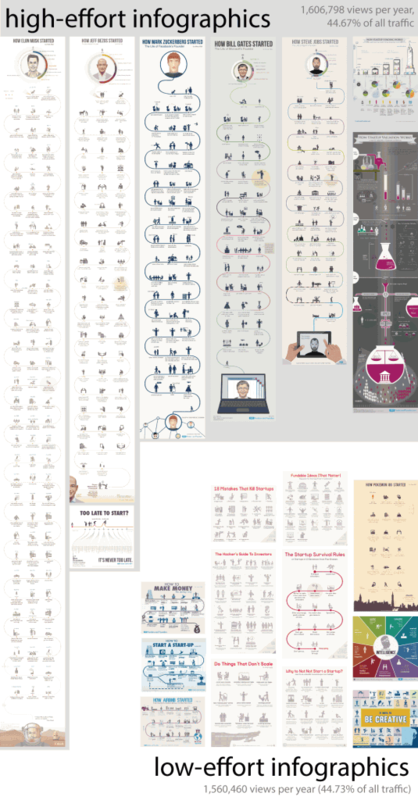 I ran experiments on my blog where I published only 60 infographics. Here are stats from my monthly revenue per revenue stream and per item. As you can see, the first 3 categories are highly scalable. The more infographics you make, the more affiliate links to books you can insert. Let’s say one links generates $61/month. 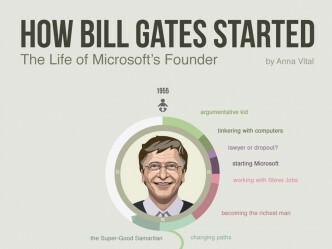 With a blog of 100 infographics. That’s already $6,100/month. Ads are also scalable. With 100 infographics and a high click through rate, which is within your control since you are the one who decides which audience to target your infographics towards, you could be making $1,000-$10,000. A good click-through rate is considered around 2%. Mine is 0.2% because I target audiences to want to read about startups but don’t necessarily have a startup to buy services for. If you target the audience that wants to read and buy, you will make more money. Here is a snapshot of a month of ad revenue. Book illustration licenses come as a steady stream as your blog grows. The narrower the topic, the more likely you will be contacted by the same publisher multiple times. Unsurprisingly, the most money is in the unscalable category – client infographics. You can’t scale your time, but you can automate the process of interacting with clients and minimize the time it takes to produce the infographic using tools like Adioma in addition to Adobe Illustrator. Let’s make a projection of how much money you can make on infographics alone, without offering custom services, but only through affiliate links, ads, product placements, and licenses. Let us say you start with a 10-page infographic blog. Let us assume that you make $0 the first week. The second week you make only $100 (on one ad banner with only 6,000 impressions with a 2% CTR). Let’s assume that you make only one infographic post per day (and I assume you will create what I call a “low-effort infographic” – minimum illustration, only text and icons set into a template. More on low-effort infographics below). From historic traffic data on my blog, I know that when I post daily I have a 9% weekly revenue growth rate on ads alone. The cumulative effect of having a lot of posts, increases the CTR for both new posts and old ones. Assuming you produce one low-effort infographic per day, here is what your revenue will look like. 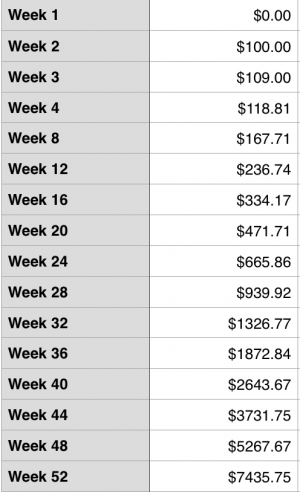 Starting with week 2, I multiplied your weekly revenue by 1.09 each week. These same numbers looks like this in a graph. At the end of your first year you could be making $7,435 a week. I isolated ad revenue here to simplify the calculation. Your ad revenue will be connected to your other activities like your social media reach, your domain rank, and your reputation as an valuable source of infographic information. This also assumes that you have daily consistency, which bloggers like Seth Godin showed is possible. I myself can also do it visually, that’s why infographics work for me as a medium. If you are a visual learner, there is a good chance they will work for you. Now let’s get back to the beginning – the reason behind all this growth is that you will find a need nestled inside a content void undiscovered by other infographic authors. Now, let’s see how exactly you can find a content void that will allow you to get an audience fast and make money on infographics. Pick a specific topic. To really make money on infographics, you need to pick a specific topic that you will cover. Just having an infographic blog on a variety of topics will not motivate your readers to go from infographic to infographic and stay on your website for long, which means you have less opportunity to suggest books, show ads and other products you might be selling. How specific should your topic be? That is the million-dollar question. This is where you need to mine the data and know the people you write for. I write about startups, as a topic. 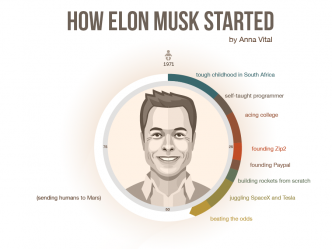 More specifically, how to start a startup. 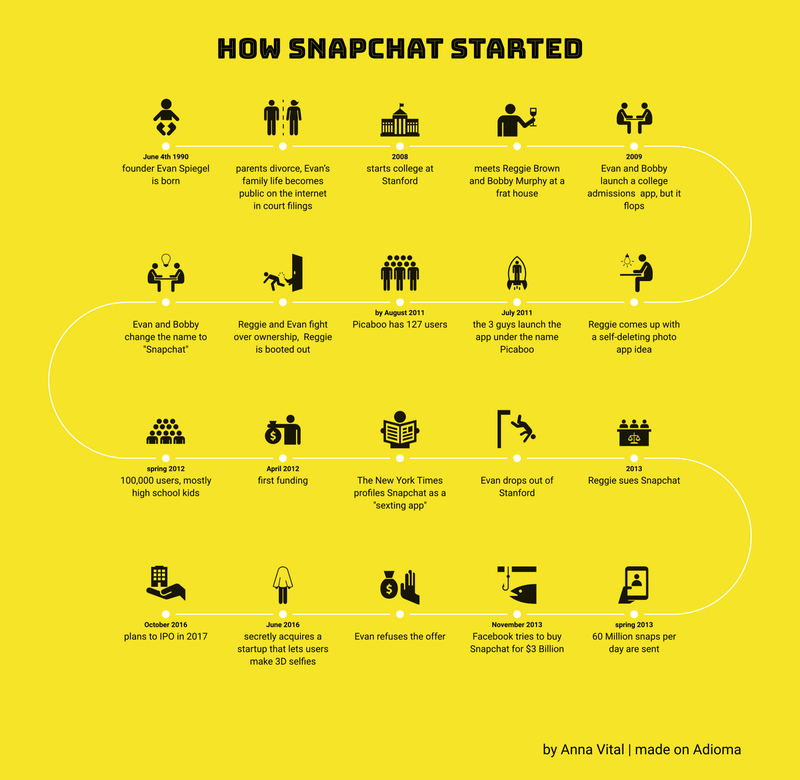 Someone who is already at a later stage startup might not find my infographics useful. So should I expand to cover later-stage startup topics? Most likely no because the audience for early stage startup topics is large enough. Do they have the motivation to buy books and services? Yes, if I estimate correctly what they need. This is the analysis you need to go through. Use absolute search volume data for the keywords you are thinking about. Find a need and fill it. Now that you have identified your topics, at least tentatively, keep these questions in the back of your mind as you look for a need that is still unfilled by existing content, infographic or otherwise. Is there an elephant in the room? Is there a lot of content on a certain topic but nothing that tackles it head on? I’ll give you an example. When I was researching how to get funding for my startup, I realized that there is no good explanation about how exactly startup funding works. There were articles on more specific topics, such as for example whether you should raise an equity round or a convertible note, but nothing about the entire process. Or why it event exists. So I create How Startup Funding Works. 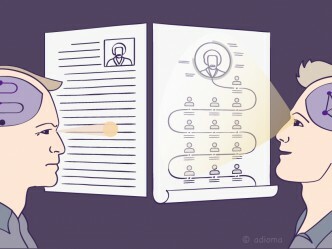 I guarantee you will find this trend of avoiding the elephant in other fields – people often pretend they understand something because everyone else is pretending it too. You can be the one who explains it. If you do a good job, you have their trust for another article. Is there a guide on a topic? Actionable guides solve the problem of starting. If you explain the sequence of steps for anything such that someone can do it, you just produced a verifiably useful infographic. Is there a big-picture compendium? Listicles are common but what is uncommon is are comprehensive lists. That requires more research but it all fills the need your reader might have to know that they have complete information of a subject. Link to books and other sources using affiliate links (Amazon’s affiliate program). Sell your own product (this may be prints of your infographics and other printed products like t-shirt, this could be an e-book or even a PDF with a compilation of your best infographics). Partner with a company that offers a product on the topic you are covering and get paid for referrals. Become a consultant – now that you have a visual work product, there is a good case to be made that you are an expert in areas like content marketing, content creation, instructional design, and information design. Sell licenses to your infographics to publishing houses who want to use them in books. Infographics can cost you from almost nothing to tens of thousands of dollars. When you are doing your research, use the cost-effective options. Speed is key. You want to prove your concepts fast. You can plan, create, publish and gather data on an infographic in a single day. Let me show you exactly how infographics that bring me traffic look like and how much traffic they bring. 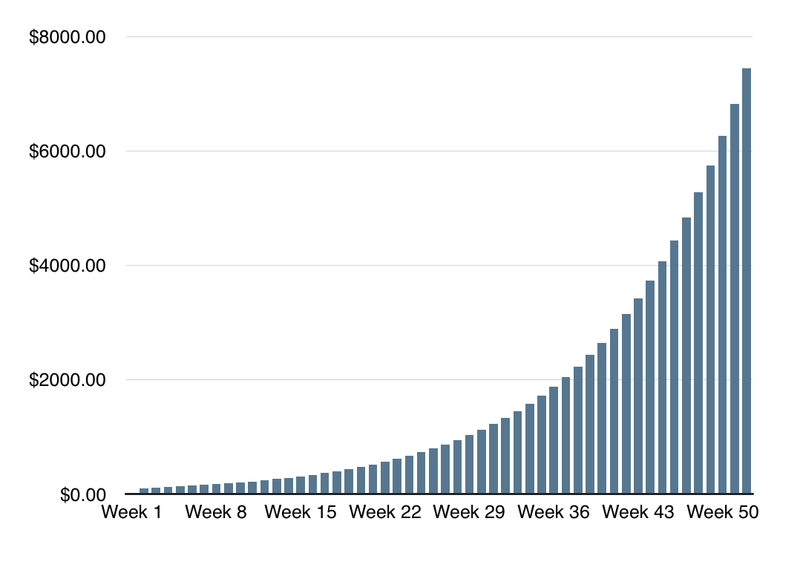 Remember the power law? Here I am showing you infographics that bring the most traffic. then I divided them by how much effort I put in to create them. At the beginning I thought that more effort=more traffic. That is not quite true. Design effort does not matter. What matters is insight and visual structure. Notice that the low effort infographics are still structured the same. But they are shorter and they have low-detail illustrations. Five of the top performing infographics are timelines – easy to follow and structured. 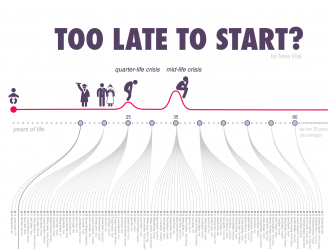 I wrote about the rules of creating a timeline infographic here. Many of these infographics were created in Illustrator, except for the timelines, which we already used Adioma to create. 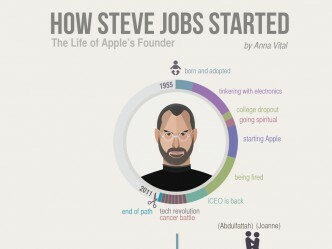 You can see that if you are not yet proficient in Illustrator and Photoshop, you can still create infographics. On Adioma, for example, you can make an infographic in a few minutes. Mark and I used to only use Illustrator, but then we realized that a lot of design can be automated, we started being more productive. First, we created a large icon library that is searchable. For everything I write in an infographic I can now find an icon fast. In some cases our algorithm finds it instantly as I type. Second, we realized that some infographic templates are so versatile that we can save time by reusing them. To reuse them we have to make the regenerate themselves for as many points as we need. Third, color schemes can be automated. There are rules of color-matching and we can automate them to apply with one click. That’s what we did when we created Adioma for ourselves to speed up our design process. Now that we use Adioma, we have made more infographics in the last 5 months than in the previous 2 years – more than 30x our productivity. Not sure if you can raise your productivity? Get a free trial of Adioma for 2 weeks and see how many readers you get in 2 weeks. We give you pre-made templates right away in your dashboard so you can get started fast. Look, if you are still hesitating because research and writing don’t sound glamorous, consider how a startup you definitely have heard of started. A little experimentation goes a long way.